CMRC Members joined 7 Mexican exchange students from Guadalajara in a service learning mini-project. We picked up trash along the Tucker Creek hike and bike trail. We held our annual Pancake Breakfast fundraiser at Stoby's. This funds our Dictionaries for 3rd graders project in Conway, Vilonia and Greenbrier.​ Thank you to everyone who came or bought a ticket. Rotary’s International President, Ian H.S. Riseley of Australia issued a call to action to plant more trees for a growing world population. ​CMRC and CNRC joined together to plant 200 trees at the Conway Expo Center. ​Annually, CMRC presents a dictionary to each 3rd grader in Faulkner County public schools. CMRC and CNRC (noon) joined together to promote Rotary at the Conway Business Expo​. CMRC hosted a tailgate party for the youth served by the Deliver Hope program. The tailgate will be held prior to the UCA vs. Sam Houston football game on 9-30-17. CMRC volunteers set-up, grilled, served food & visited with the kids. 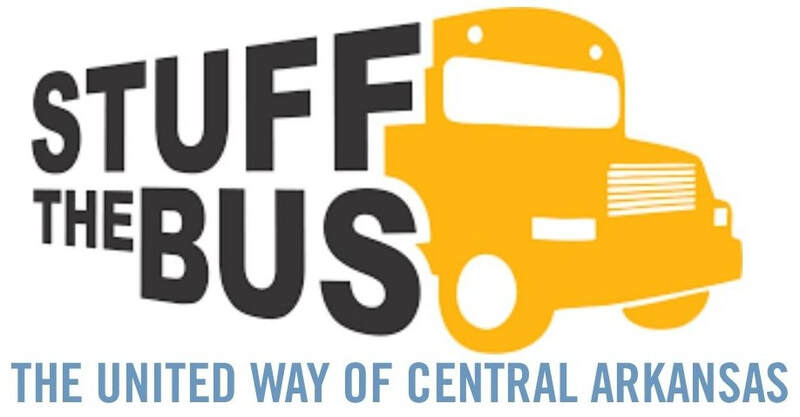 Stuff the Bus eases the financial burden on families with school-aged children that are struggling to make ends meet, giving a student who is in need the required supplies promotes learning, encourages self-esteem and helps kids stay in school. It’s more than school supplies. It’s the first step to prepare students for a fulfilling, successful future. . .
Aug. 1st. and donated over $300 worth of supplies and cash​ to Stuff the Bus. The Conway Morning Rotary Club believes that a creative spirit and a good deal of muscle power will yield the impetus for enriching the environment at Cadron Settlement Park. With that credo taking hold, the club is in the midst of working toward sprucing up the grounds of the historic park and nurturing good ideas to restore the beauty of the landscape.